Verve Marketing Group announces that it has received the Outstanding Achievement WebAward from the Web Marketing Association for its design and development of Thomas Nelson’s Bible website. The WebAward is the premier website competition for web developers and advertising agencies. The competition judges all aspects of a website, with particular emphasis on the creativity, functionality, and overall interactive experience. Entries are judged and scored on design, innovation, content, technology, interactivity, copywriting, and ease of use. Sites scoring above 86% of the total possible are awarded the Outstanding Achievement WebAward. 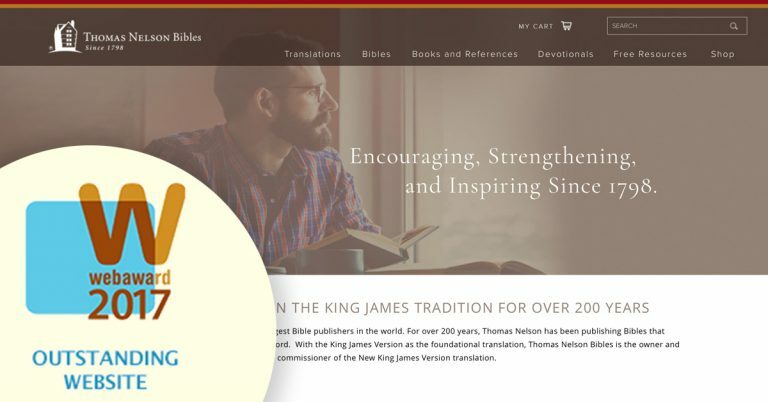 “A key goal for us was to elevate the Thomas Nelson Bibles brand and translation subbrands, as well as to create a user-friendly way for consumers to narrow down and find the right Bible from the 1,000 or so on the site,” noted Joan Begitschke, Chief Marketing Strategist at Verve Marketing Group. “Jerri Helms at HCCP came to us with the vision of creating a site that would bring all Nelson Bible translations and individual Bible product sites under one umbrella website,” she continues. Web design and development firms compete globally within 95 industry categories in the annual WebAward competition. The Thomas Nelson Bibles site won in the Publishing category.